one of the best animes i have seen so far just aired this season (spring 2013). 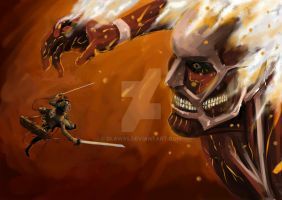 It's name is Shingeki no Kyojin and omg....i mean the storyline/telling is so different to what i normally see and humans are so mortal. One single misstake and the soldiers are titan-food. as i am following just the anime i am pushing myself really hard not to read the manga and don't get myself spoiled everywhere..
if you don't know the anime---WATCH IT! really you found my artwork at a con? 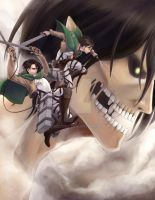 Bertholdt will repel those soldiers with his STEAM! It turned out incredible. You should be very proud of yourself. i found this in the manga when i was reading it. it's really good! i have it as my background now. I hope they dub it soon, I don't want to watch it quite enough to watch the subs but I might just have to give in if it doesn't happen soon. I don't really want to get into why I don't like subs but one simple reason is that I want to be looking at what's happening and have my full attention on the animation rather than always being distracted. I grant you the voices are sometimes weird but that can be said for the original voice cast as well, the reason I prefer dubs is solely so I can keep my eye on what's going on rather than having to look at the bottom of the screen the whole time. It also makes it so that if I'm so inclined I can do something else with the show minimized and I won't be missing everything. Honestly every character could be voice by the guy that played Pee Wee Herman (in character as Herman) and I would still prefer it over subs. I read books to read, I watch shows to watch, not to read. This is amazing! Good work. wow thank you very much!!! i love that anime so much! AWESOME, ridiculously awesome. OMG where have I been, read the manga, but had no idea there was an anime, going to watch now. It's really incredible, great job! Armin's pose is awesome !! And this art is really good, keep up the work!! Just watched an Englished subbed version of episode 1. That was intense 0_o When it out in english? I've been watching it and it is the best anime I've seen so far! I Love It!!!! !